F850-X1 In-Motion Check-weighing Indicator is a variation of the original F850 weighing controller. The F850-X1 is your solution for production inspection, improving quality control by instantly correcting improper packing (cartons, bags or bottles). Up to 100 memory sets containing Target weights with Over & Under are stored by code number. 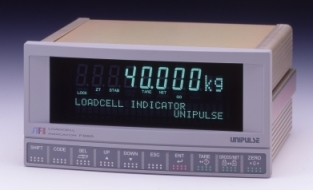 This allows presetting of weighing parameters for different product runs. F850-X1's unique feature of moving average analysis to start and stop weighing simplifies installation. A large, bright vacuum fluorescent display shows Gross, Net, Last Checking Weight or Deviation from target Weight and Standard Deviation. Other parameters shown in real-time are: Total Quantity, Over/Under Target Weight, and Target Weight Quantity. The Sample Weight function furnishes instant feedback on the check-weighing process. The Deviation from Target Weight and Standard Deviation function allows early correction of Quality Control problems. The optional M350 intelligent printer provides automatic data logging, improving production control while recording results to a PC memory card. 2... Preset value up to 100 coded groups of set point values with sequential running totals for each group. 4... Bessel type low-pass analog filter (2,4,6,8Hz) and selectable digital filter (2,4,8,16. 32, 64,128 times per sec.) prevent the influence of vibration. 5... Self-Check and Watch-Dog timer function in CPU, ROM and internal circuitry to insure reliability. 6... DIN-sized front panel and large 17mm (0.67 inch) display. 7... Full digital front panel calibration. 8... All setting value backed ?up to non-volatile RAM and C-MOS RAM by lithium battery prevent data loss from a power failure.